The pecan tree is valued for both its shade and nuts and is native to the eastern, midwest and southern United States, according to the United States Department of Agriculture. 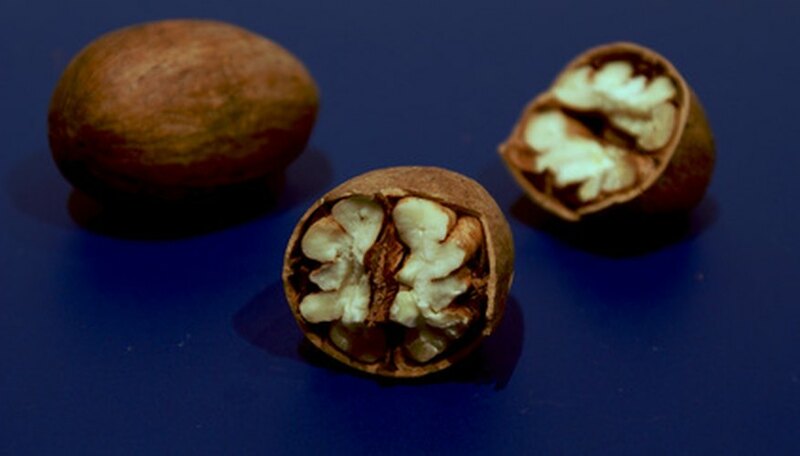 Although it is a hardy tree, the pecan is nevertheless susceptible to both infestation from such pests as the pecan nut casebearer and nut curculio and diseases caused by fungus and nutrient deficiencies. Along with the casebearer and nut curculio, the main pests that affect pecan trees also include the hickory shuckworm, pecan weevil and pecan phylloxera, according to the University of Missouri Extension. Treatment includes applying insecticides formulated for these pests, such as chlorpyrifos, endosulfan and carbaryl, although application times vary depending on the pest. In the case of the pecan nut casebearer, there is a narrow time frame that varies every year in which to kill both the larvae, females and offspring. To control the nut curculio, shuckworm and pecan weevil, apply insecticide in early August. To control the pecan phylloxera, apply insecticide on new growth, before the larvae hatch. Pecan trees are prone to fungus diseases such as scab, powdery mildew, crown gall and wood or heart rots, according to the North Carolina Cooperative Extension Service. Treatment to control scab includes removing affected leaves and husks and applying a fungicide such as benomyl, fenbuconazole or propiconazole, beginning when the leaves sprout and continuing every 2 to 3 weeks thereafter until the pecans are ready. Treat powdery mildew with the same fungicides used for scab. Prevent crown gall by treating the seeds before planting the trees and planting only disease-free trees. Treat wood or heart rots by pruning the affected areas and treating with a wood dressing made with asphalt. Nutrient deficiencies, either nitrogren or zinc, also cause problems with pecan trees, according to the University of Florida Extension. Treat nitrogen deficiency, which presents as yellow or light green leaves, stunted growth and even leaf shedding, by applying either ammonium nitrate or sulfate to the soil around the tree. Treatment for a zinc deficiency, which will present as noticeably smaller leaf size, leaf curling and bronzing and twig dieback, includes adding zinc sulfate to the soil at the base of the trunk. To treat nickel deficiency, which results in small, underdeveloped leaflets, by applying nickel to the soil.